where XM and Xc are the measured and calculated values for any inertial reference vectors (e.g., nadir or magnetic field) and Sc is the calculated inertia! Sun vector. Note that this procedure can fail for certain geometries. For example, if the Sun sensor boresights are dispersed at a half cone angle 0 with respect to the spacecraft Z-axis, Eq. (9-34) is independent of / when \M is colinear with the Z-axis. Data from horizon scanners, either those sensitive to the visible or the infrared portion of the electromagnetic spectrum, must be validated to reject spurious triggerings caused by the Sun, the Moon, or reflections from spacecraft hardware. For visible light sensors, a further test is required to distinguish between horizon and terminator crossings (Section 4.1). Although most spurious triggerings are relatively simple to identify (Section 8.1), terminator crossings escape most preprocessing tests and normally are eliminated after the attitude computation by a data regeneration test [Joseph, 1972] or solution averaging (Section 11.2). However, a simple scalar test based on the arc length separation, a, between the Sun, S, and the triggering event, X, will suffice for both central body identification and terminator rejection for all cases for which the data regeneration test will succeed [Williams, 1972]. Fig. 9-14. Definition of Sun to Central Body Angles Which Define Event Classification. 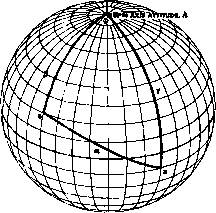 Light and dark portions of the central body are interchanged for the Sun at the opposite pole, a, and <p are measured from the Sun and are defined in Eqs. (9-36) through (9-43). The requirements for visible light data are more restrictive. First, consider the crescent geometry of Fig. 9-14. 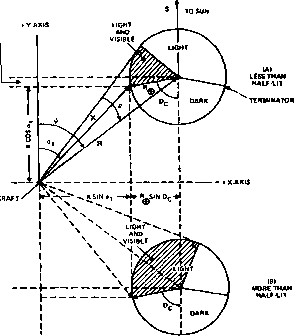 Note that the angles a, and ip on the figure are measured from the Sun. The small circle of constant a, is tangent to the terminator on the SR great circle and the small circle of constant a2 passes through the cusps or the points where the horizon and terminator intersect. 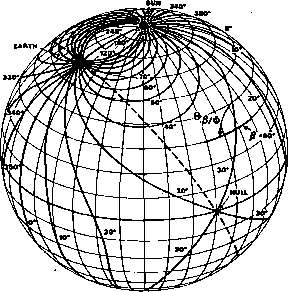 Clearly, a triggering at latitudes Oq < a < a, can result only from the central body horizon. 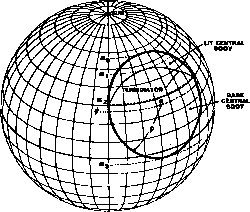 Triggerings at .latitudes a, <a < a2 can result from either the horizon or the terminator. * This is defined as the indeterminate case. Triggerings at latitudes a>a2 are necessarily spurious. The angles a, and a2 may be calculated with the aid of the upper half of Fig. 9-15. The plane of the figure contains the vectors S and R with the spacecraft at the origin and the Sun along the + Y axis. By symmetry, this plane also contains X at the angle a = a,. Dc (89.15 deg) is the dark angle defined in Section 4.1. 'Data regeneration procedures will attribute this data unambiguously (and incorrectly) to a horizon crossing.